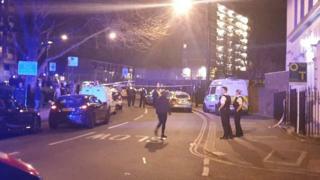 A man has been stabbed to death in a knife attack in north London. The victim, thought to be in his 20s, was stabbed near the junction of Grafton Road and Vicars Road in Gospel Oak at about 20:30 BST on Monday. Ambulance staff tried to revive him but he was pronounced dead at the scene. Murder detectives said he had not been formally identified, but his family had been informed. Police appealed for witnesses and said no arrests had yet been made. A post-mortem examination has not yet taken place. Claude Mampuila, 54, who said he was the victim's uncle, said the family had "lost someone special". He said: "The family came here from the Congo for protection - there was a war there - and now this has happened in London. "We were thinking if you come to this country you are protected, but it is not safe at all." A neighbour said he put the victim into the recovery position, adding that he saw five boys fleeing the scene. The man, who did not want to be named, said the victim's mother was at the scene following the attack. A woman, who would not give her name but said she was the victim's cousin, told the Press Association the man "had a good home, a good girlfriend and he had things going for him". "He was not the sort of boy to get into trouble. He kept himself to himself," she said. Twenty three people have been fatally stabbed in London this year. The killing came on the same day as Prime Minister Theresa May hosted a summit on knife crime. She said the issue was "deep-seated" and would require a cross-society effort to tackle it, but police officers, teachers and nurses were critical of plans for them to be accountable for failing to "spot warning signs" of violent crime. "We cannot simply arrest ourselves out of this problem," Mrs May said. Flowers and candles have been placed in tribute to the victim near the scene. A message attached to one bouquet read: "Long time I haven't seen you but it was always love when I did. Rest easy bro." Another message said: "Always in our hearts. Going to miss you my bro. To the young king. Gone but never forgotten."